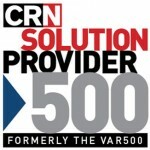 Named to CRN Solution Provider 500 - Aktion Associates, Inc.
Aktion Associates, Inc., a leading IT consulting and technology integration firm, today announced it has been named to The Channel Company’s 2015 CRN® Solution Provider 500. The annual list, spanning eight categories, from hardware and software sales to managed IT services, recognizes the top revenue-generating technology integrators, MSPs and IT consultants in North America. Solution providers are ranked based on revenue, determined by product and services sales during 2014.